Iraq’s Hashd al-Shaabi (Popular Mobilization Forces) says the US was behind a recent missile attack which wounded several commanders of popular forces in Tal Afar airport. “The tent in Tal Afar Airport where the commanders of Iraqi popular forces and Iraqi Primer Minister had convened was targeted by a missile on Thursday, November 25, 4:15 pm local time. The attack wounded several members of popular forces,” Popular Mobilization Forces announced in a statement, according to a report by Al-Alam, as translated by IFP. Ahmad al-Assadi, the spokesman for Iraq’s Hashd al-Shaabi announced on Friday that three commanders had been wounded in the missile attack on Tal Afar airport. 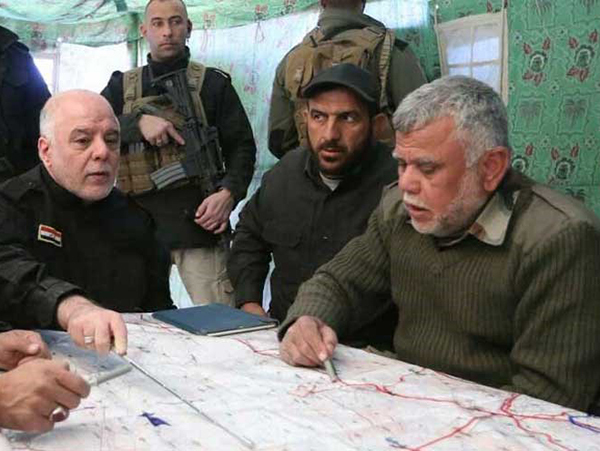 There were speculations that the commander of Iraqi popular forces Abu Mahdi al-Muhandis has been killed in the airstrike. However, he put an end to the rumours by appearing in a televised interview with Al Alam News Network, showing that he is alive and the ongoing anti-ISIS operations will go on more strongly than ever.